During the holiday season, emergency rooms nationwide are flooded with victims of holiday decor gone wrong. Across the U.S., holiday lights are to blame for 160 home structure fires each year and $9 million in direct property damage, according to the Electrical Safety Foundation International. Are you putting lights or other decor on your house for the holidays? 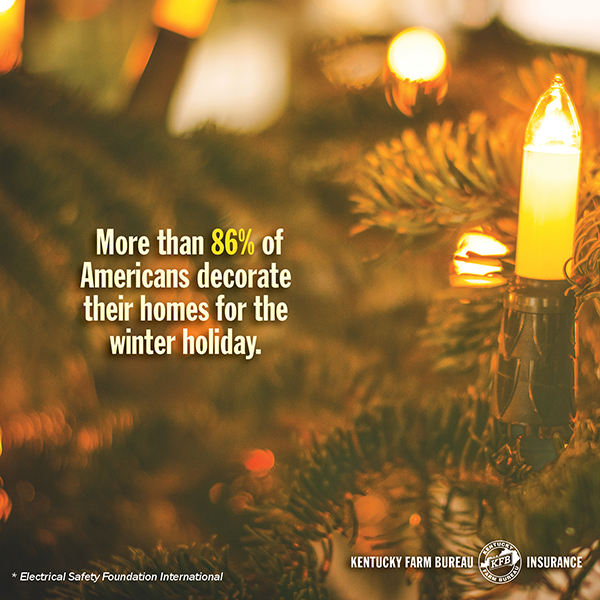 More than 86% of Americans decorate their homes as part of their winter holiday celebrations, according to the Electrical Safety Foundation International, or ESFI. We get it. The allure of draping your home in bright, twinkling bulbs and adorning your yard with giant blow-up reindeer is irresistible; but when it comes to holiday decorating, stockings aren’t the only things that should be hung with care. Take extra caution when decorating this season so you can continue to do so for years to come. Take proper steps to ensure your home is ready for the holiday glitz. For instance, clean dried leaves out of gutters before hanging that first string of lights. Hot lights resting on dry leaves can create a fire hazard. Check new and old light strings and décor for things like frayed wires, damaged insulation, broken or cracked sockets, and loose connections. Throw out and replace damaged sets. 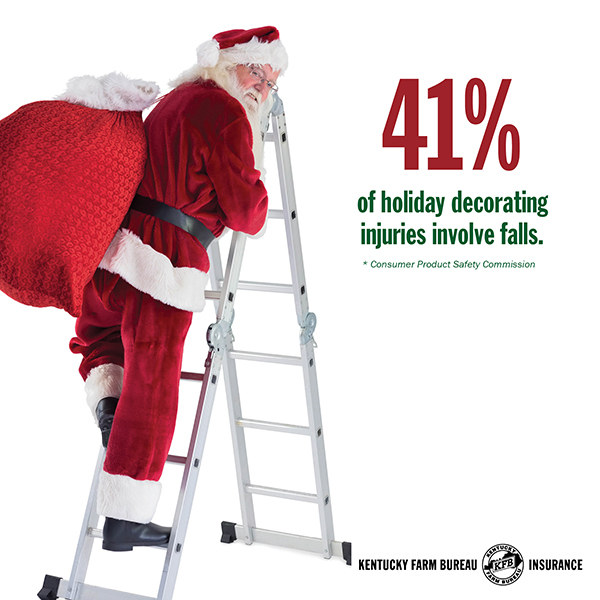 41% of holiday decorating injuries involve falls, according to the Consumer Product Safety Commission (CPSC). Inspect ladders for loose or missing screws, hinges, bolts, or nuts before using. If hanging lights or other electric décor, make sure the ladder is fiberglass or wooden, as metal ladders conduct electricity! Also check the ladder’s height – if you’re tiptoeing from the top rung to reach your roof, you’re in danger! To be safe, your ladder should extend at least three feet past the edge of your roof. Across the U.S., holiday lights are to blame for 160 home structure fires each year and $9 million in direct property damage, according to ESFI. Did you know that incandescent bulbs generate most of their energy in heat? Newer, more modern LED lights are much cooler to the touch. LED lights are made with epoxy lenses, not glass, and are much more durable. Additionally, they last 25 times longer and use at least 75 percent less energy than their incandescent counterparts, according to the U.S. Department of Energy. To give mother earth and your electricity bill a bigger break, install an outdoor timer to automatically turn your lights on and off. 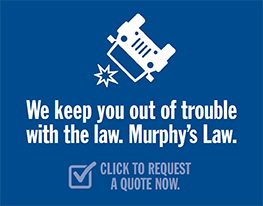 Oh, and if replacing bulbs or fuses, always unplug first! Educate yourself on extension cords. 3,300 residential fires in the U.S. are caused by faulty extension cords each year, resulting in 50 deaths and 270 injuries, according the CPSC. When decking the halls for the holidays, there are more important things to worry about than hiding gawky extension cords from view. Never plug cords into one another, make sure that cords are rated for their intended use, and keep them clear of snow and standing water. Your décor’s power needs should match the amperage rating on the extension cord packaging or label. 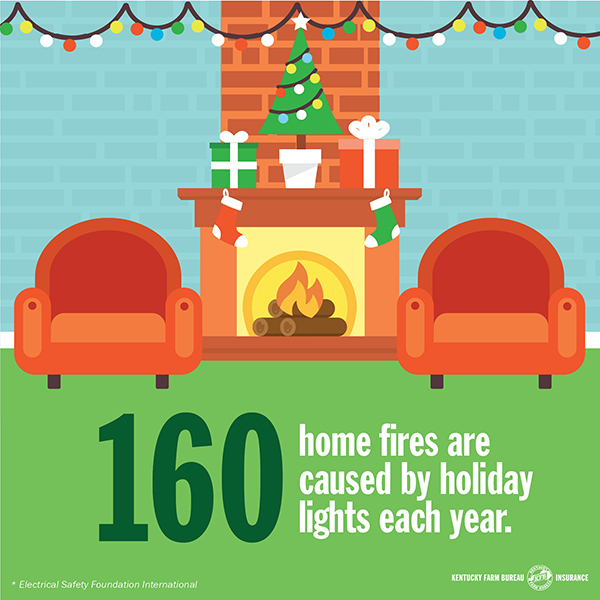 Avoid overloading electrical outlets with too many decorations or electrical devices, which can spark a fire. Outdoor electric lights and decorations should be plugged into circuits protected by ground fault circuit interrupters (GFCIs). If circuits are not GFCI-protected, portable outdoor GFCIs can be purchased at most local hardware stores. During the holiday season, emergency rooms nationwide are flooded with victims of holiday decor gone wrong. During the last two months of 2015, U.S. hospitals treated a whopping 14,000 injuries due to holiday decorating faux paus (according to the latest available data by CPSC). To put that into perspective, that’s about 230 injuries per day during the holiday season! Please be safe so this season can stay a jolly one!